Our Dream For Our Pups is Within Reach by Knick Knack Pittie Pack, Inc.
By Knick Knack Pittie Pack, Inc.
Knick Knack Pittie Pack, Inc. hasn't added a story. I am setting the goal at $5000 but if we reach that, I will raise it because every penny raised will be used for this purpose... If we cannot make this dream happen right now, we will be disappointed because this is the PERFECT place for Knick Knack, but we will continue looking so the money collected would be transferred to a separate bank account to be used for a future property purchase... but we are truly hoping we can make this one happen!! Please help us and our pups!! If we are able to get a facility, it would be easier for folks to volunteer, visit, donate items such as food, treats, blankets... I wouldn't have to worry about whether or not I can make it to all of our pups in bad weather due to road conditions... adoptions will go up because potential adopters can actually come SEE our pups during "open" hours... it's a win/win/win/win situation!!! Knick Knack Pittie Pack, Inc. hasn't posted any updates yet. 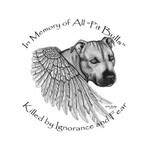 Knick Knack Pittie Pack, Inc. is managing the funds for this campaign.